When I was 10, I wrote my first short story. The heroine was a little girl named Kate who has a run-in with the Green Garbage Monster. It wouldn't win any awards but it's the first time I realized that I had the power to write. That my words could capture attention. I saw firsthand how the written word can influence other people. Now there's power! The copywriting I now do for companies like Dow and Consumers Credit Union and organizations like the Cookware Manufacturers Association still tells stories. Brand stories, that is. Like the story about Kate, these stories capture attention. They influence people, too. However, these stories are not simply for entertainment. These stories always end with a call-to-action that creates a path for prospects to become paying customers. "Where does creativity come from? How can we be more creative?" Answering these questions became a quest. I observed what we did when faced with challenges. What things led us into ruts. I read books and articles about creativity. None provided complete answers. 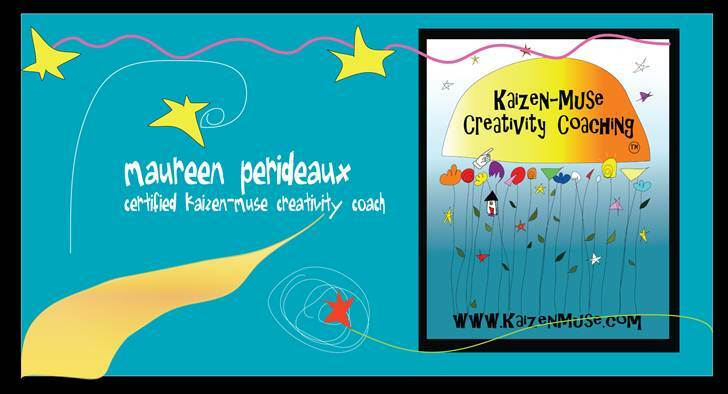 I became a certified Kaizen-Muse Creativity Coach. To add another dimension to my understanding, I earned a certificate as Human-Centered Design (HCD) facilitator. These trainings provided me with an invaluable toolkit for helping people tap into their own creativity. Each of us is creative. Creativity is not a gift for a chosen few. It's a gift we all have. Including you! And you can learn how to amp it up! That's where I help. It is now part of my life purpose to teach people how to ignite their ideas. How to get past creative blocks. How to generate new ideas. I've taken all I've learned as a professional writer, a dabbler in the arts, and a creative coach and HCD facilitator, and created workshops and speeches. I'd love to share one with you! READY TO IGNITE YOUR IDEAS? Let's talk! Drop me a line at maureen@brilliantsparks.com.